I am such a morning person. This panel discussion started way too late in the day for me. Gratitude to network for arranging the conversation. Pity for the viewers of my part in it. 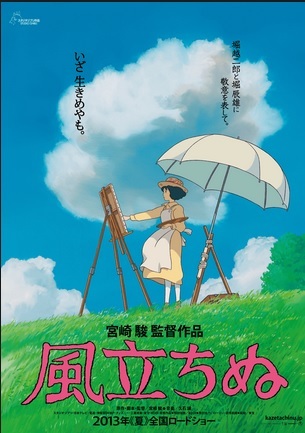 Animation giant Miyazaki Hayao is catching a lot of grief in the social mediasphere for an essay he wrote for the July edition of the Studio Ghibli in-house magazine Neppu (Link). Writing for Japan Focus, Professor Matthew Penney examines the essay (Link) in the context of the release of Miyazaki's latest and possibly most ambitious film, Kaze Tachinu and the greater Miyazaki and Studio Ghibli oeuvre. This below is my personal, stuttering translation of the excerpts from the essay published on page 6 of the morning edition of the Tokyo Shimbun of 19 July 2013. 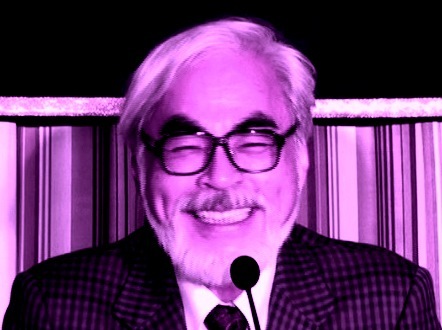 One of the difficulties is trying to decide what to do with Miyazaki's loose, conversational style. In the essay he is talking through writing, bouncing around among a lot of different registers. 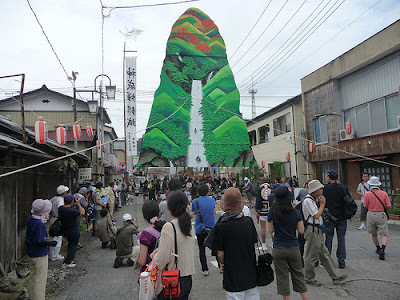 The result sounds, in my poor translation, as though Miyazaki wrote or dictated the piece while stoned. Miyazaki's thinking is also is non-systematic and idiosyncratic, just like some of his movies (Ponyo violates the cinematic convention of fantasy worlds having at least some recognizable physical laws, leading to extreme annoyance with the film among some segments of the fan base). There is plenty in what appears below to exasperate and tick off just about everyone. As for changing the Constitution, it is not even a question that I am against it. 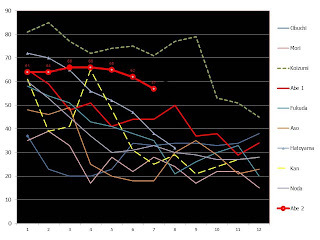 If one considers the election [of December 2012], the percentage of votes won and the voter turnout were both low. It is inconceivable to profit from the confusion to go about changing the constitution on the merest whim. To legally change the stipulations of Article 96 and then doing come-what-may based upon the changes, is fraud. It should not be done. Since [altering the Constitution] is something that will determine the future of the nation, it must reflect the opinions of the greatest number of persons possible. 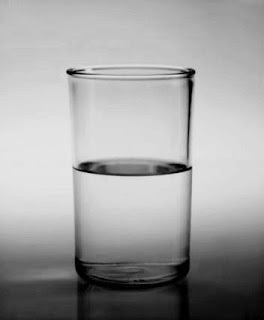 Even though I do not believe at all that "if there are many involved it will then be correct" -- if we are going to change it, then we must have meticulous debates. Despite this being the case, right now if someone lets the truth slip out and a big brouhaha ensues, they seem to deceptively dance around the subject, saying stuff like, "Oh, we did not mean it like that." When this happens, one just gets fed up with the lack of historical awareness and/or guiding principles among the top leaders of the government and the political parties. It is best that those lacking a capacity to think not be allowed to play around with things like constitutions. Of course, if you line up the Self Defense Forces alongside Article 9, clearly something weird is going on. Let it be weird. There is no reason to make it into a "National Defense Military." This is because it will be incredibly idiotic to create a massive force of bureaucrats whose whose employment is military activity. Right now, watching the Self Defense Forces getting dispatched on disaster relief here and there, I feel very happy that the SDF exists. The personnel of the SDF are doing good things and doing them properly. Even when they could not avoid being sent to Iraq, they came home having not fired a single shot, without killing a single human being. I think this admirable. After the end of the Gulf War, the dispatch of a minesweeping flotilla could not be avoided. The tiny ships silently cleared the waters that [on the surface] seemingly had no sea mines. I am sure it was terribly difficult. Then they quietly returned to port. Though I said nothing at the time, I was deeply moved. I am not sure, when the spark of war is in fact struck, whether in that moment the articles of the constitution will be in need of change or not. What I do know is that if we decide to only defend ourselves that will be enough. Even though this means that our response will be delayed, we will not strike the first blow, and not have to defend overreaction. If we do not [limit ourselves to self-defense only], I tell you, we in this country, not used to international politics, will simply be led around by the nose. Even in the case of the breakout of war, [the suffering from our slower response] is still preferable to the alternative. Anyway, because we have told these lies up to this point, I believe it best that we continue doing so. Those who seek consistency, they probably want to say, "Pre-war Japan was not bad." Though they say it, [pre-war Japan] was bad. If you do not recognize this, forget it. For the comfort women problem, for the humiliation of the various peoples [of Asia], we must properly apologize and must pay proper compensation. As for the territorial disputes, let us make the offer of dividing the territory in half, or make the offer of "Let's jointly administering these territories." These problems, no matter how worked up we get over them, or whether we submit them to the International Court of Justice, will not likely die down. Certainly there are countries which are acting in an expansionist manner, just as once upon a time Japan acted in an expansionist manner. However, that does not mean we have to go to war. 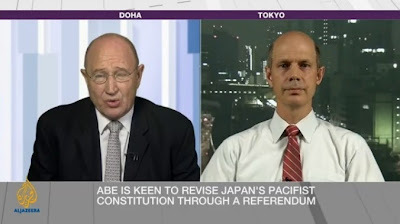 I honestly believe that right now, rather than [traditional security actions] we have to grapple sincerely and honestly with Japan's corporate structures. Can a country strewn with nuclear power plants like ours go to war? Absurd! That China is becoming expansionist is due to problems intrinsic to China. In addition, the internal contradictions of China are now the internal contradictions of the whole world. So it is not the case, I think, that we could settle the problems simply by increasing our stock of military materiel and changing [the name of the our forces] to a "National Defense Military." Later - The Mainichi Shimbun English edition now has put up its account of the brewing storm (Link). Hat tip to reader JL. 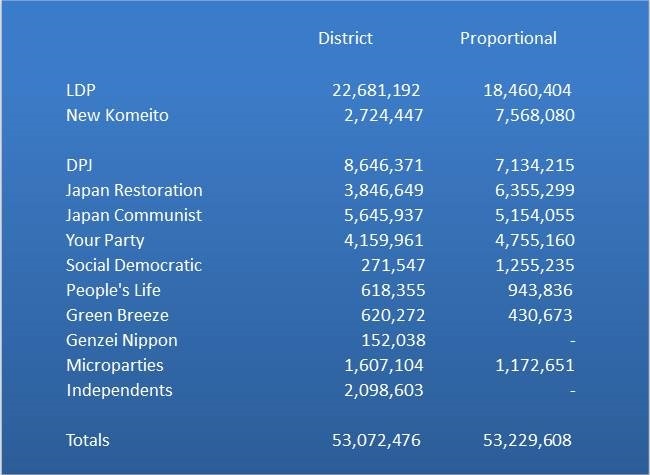 Look at the shift of vote totals in the district and proportional columns for the LDP and the New Komeito. 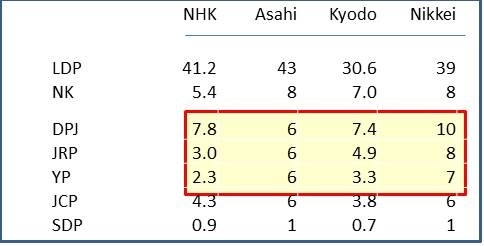 In past national elections, the ratios of the shifts has been one-to-one, with the increase in the numbers for New Komeito in the move from district to proportional equal to the decrease in the numbers for the LDP between the two columns. 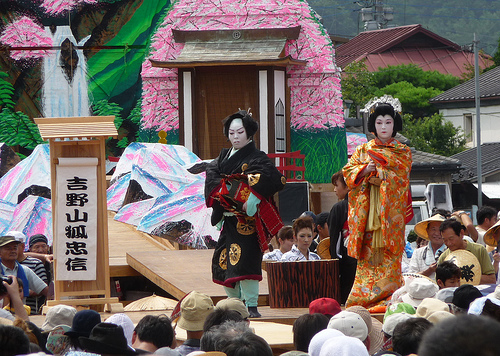 This year, the numbers for LDP district candidates is 600,000 voters short. 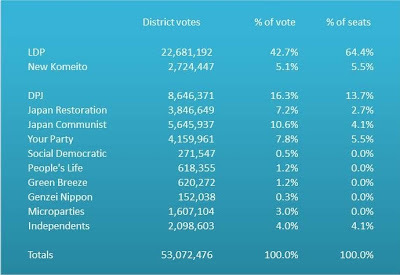 So who did those 600,000 New Komeito voters cast their ballots for in the district elections? 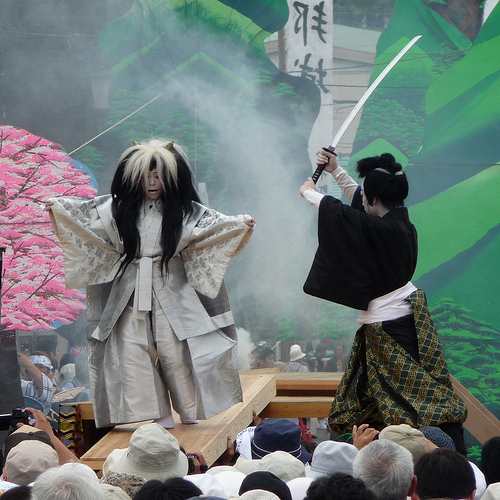 b) to give the New Komeito some extra leverage in its coalition negotiations with the LDP. a) Is the system geared? You bet it is. 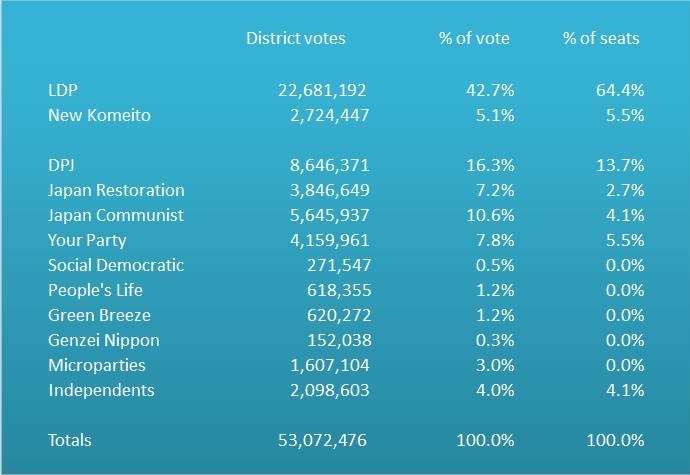 The LDP gets 42.7% of district votes and walks away with 64.4% of the seats. b) Imagine how many more ballots would be spoilt if not for the proportional voting! 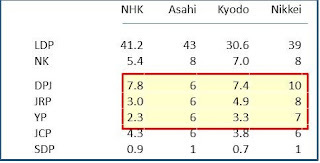 c) Look at the near perfect efficiency of New Komeito district voting. Wow, wow, wow. 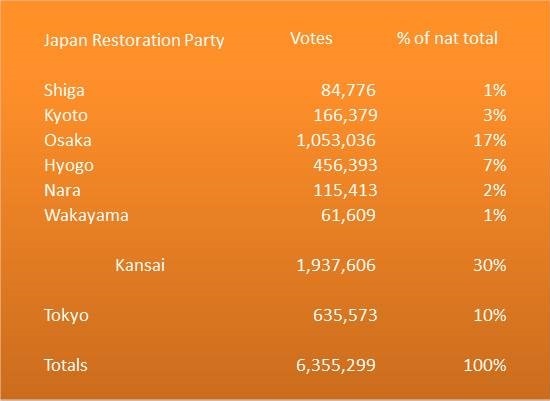 Predictably, the Japan Restoration Party did exceptionally well in the Kansai region. 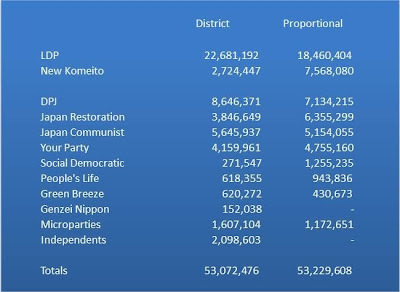 Some 30% of its national totals came from the 6 Kansai prefectures, where the party captured from 14%-29% of the proportional vote in each. However, the party did OK in Tokyo, winning 10% of its total vote there, pretty much in line with Tokyo's slice of the national voting age population. When one is talking about the candidates on the proportional list for the 2013 edition of the reconstituted umbrella Liberal Democratic Party, the one you love will be the candidate representing your industry or profession or an archetypal super-patriot. Those who argue that Japan is insufficiently democratic are clearly mistaken. All the industries and professions get a Senator to call their own. Based upon an original observation that Dr. Ehud Harari posted to the SSJ-Forum. 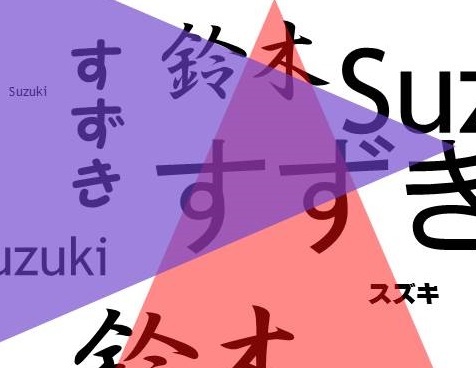 Newsflash: a Japanese citizen, educated in Canada, spoke in English for an hour yesterday. Hat tip to moderator Michael Penn for forwarding the Yomiuri Shimbun's account of Green Breeze party leader Tanioka Kuniko's unbelievable feat. Prime Minister Abe Shinzo filling out his absentee ballot for Sunday's House of Councillors election on Tuesday, July 16, 2013. Have the secretary post a photo image taken with a mobile device on the Facebook page to remind the true believers and only the true believers of the absentee ballot option. Image courtesy: Abe Shinzo page on Facebook. Assuming that everything goes perfectly -- and I do mean perfectly -- for the Liberal Democratic Party in the district seat elections on July 21, and assuming its allies in constitutional revision the Japan Restoration Party and the Your Party pick up the majority of the seats remaining after one subtracts the four seats the New Komeito must/will win, the combined forces of constitutional revision will control 123 of the 161 162 seats they need to have a 2/3rds majority in the House of Councillors. Can the forces of revision win the further 38 39 seats they need to reach the magical 161 162 total? 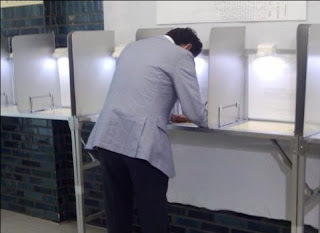 In addition to voting for the district candidate, voters write either the name of a party member or the name of a party on a separate ballot. These votes are tallied according to party, with the vote for the individual counted as a vote for the party with whom he or she is affiliated. The 48 seats up for election on this separate ballot are the proportional vote. Seats are divvied up using the d’Hondt method, meaning the vote totals are divided by one, then by two, then by three..with the largest remaining result getting the next available seat. If you do not want to think to too much about the method but just want the results, here is a great calculator (Tip of the hat to Tobias Harris of Observing Japan). The first guess one needs to make regarding the inputs, and it is a doozy, is how many folks will show up at the polling stations on July 21. As I insinuated in a post the other day major elections of the past year have featured record-breaking or close-to-record-setting low levels of voter turnout. - the absence of real policy choice in between the parties. The last items does not mean that the parties are indistinguishable, for they do offer different mixes of policies. However, none of these mixes is either inspired or inspiring, leading voters more likely to choose, when they show up, the parties that can enact any policies. To these reasons for sitting out this election out we have to add the possibility of unpleasant weather on election day actively dissuading folks from leaving their homes to go to the polling stations (this summer has been naaaaassssty!). The number of persons casting ballots I come up with, in a brutish, what-the-hell calculus, is 48,000,000 . That is a whopping 12 million voters down from the House of Councillors elections in 2007 and 2010. It is also a greater drop than the huge fall in between the 2009 and 2012 House of Representatives elections, when 10,000,000 voters who showed up in 2009 failed to show up last year. The voting rate in this guestimate is nevertheless still more than 44.67% recorded in the 1995 House of Councillors election. The median age of the voters has risen since 1995, and older voters vote more, so that despite all the negative forces listed above, a turnout rate of 46% (based on the latest, July 8 figure from the Ministry for General Affairs and Telecommunications of 104,780,660 persons eligible to vote) seems about right. Now, how will these votes be divided up? 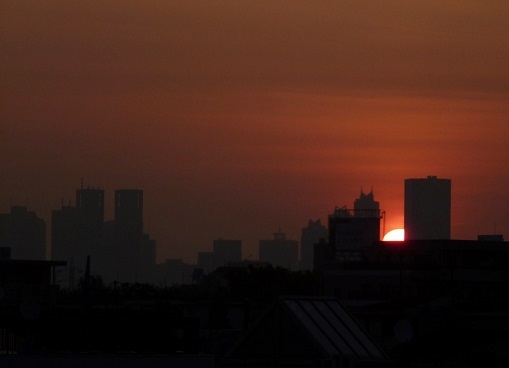 Let us make two incredibly generous assumptions to critics who find me too solicitous of the LDP, one supposition regarding the DPJ based on atmospherics and one boneheaded assertion. 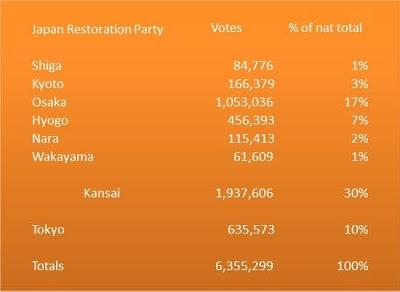 The first is that the LDP does no better in the vote than its current 42% rate of support in public opinion polls, despite the concentration of power the drop in voter participation gives to vote machines. The second is that centrist voters, wary of giving the LDP too much support, will give their votes to the main center-right opposition DPJ, JRP and Your Party in about equal amounts. The third is that public trust in the DPJ has sunk to the point where the Your Party and the DPJ win exactly the same number of votes. 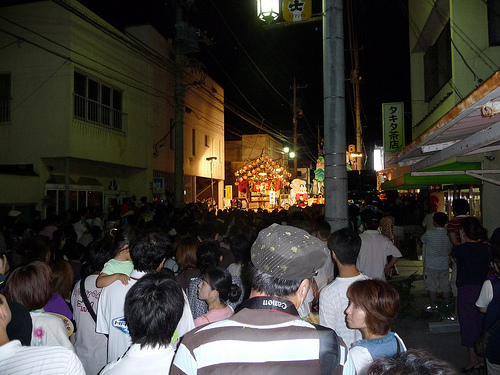 The fourth, the dumb one, is that at least 7,000,000 folks plunk down for the New Komeito and its candidates. The projection, biased upon the assumption of no last minute reversal of the decay of support for the DPJ, still only secures only 31 seats for the revisionists, 7 seats short of Constitutional Revision Nirvana. The fly in the constitutional revision crowd's punch bowl is...surprise! (not really) the NEW KOMEITO. Unless the leaders of the New Komeito or That Which Cannot Be Named tell their voters to not show up on the 21st, their immobile mass will outweigh any projected "rightward shift" in favor of constitutional revision. I invite readers to play around with the calculator, trying out higher voter turnouts and different support levels based on the public opinion survey the individual reader may fancy. Fiddle as one might, the leap to the 161 162 seats needed for constitutional revision -- even when making assumptions equivalent to pretty much everything goes the revisionists' way on election eve -- remains just too far off. The results are pretty much as one would expect...and pretty depressing. 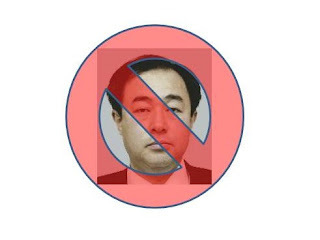 Chinese and South Korean citizens and their respective governments are locked in a feedback loop of anti-Japanese hatred (I would write antipathy, but why equivocate?) from which no easy exit is visible...nor any exit at all, really. 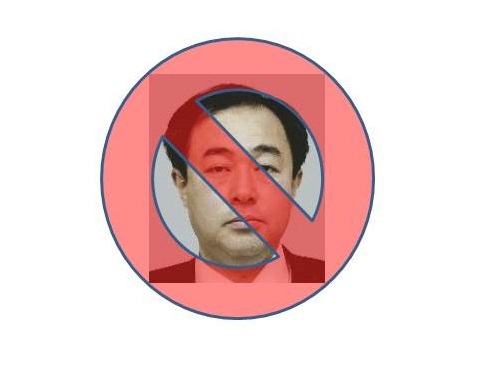 Prime Minister Abe is seen unfavorably in equal measure in the two countries -- 85% unfavorably -- at very high levels of certainty (only 6% of Chinese and 2% of South Koreans do not feel they know enough to make a call on Abe). Were I Abe (and boy are you ever not him - Ed.) I would look at these results, look at my August schedule, shrug and pencil in my Yasukuni visit. "Look at these numbers. Seriously, how much worse could it get?" he could ask -- and he would be right. What is the reason for the second Abe Administration's high support ratings seven months out? Support for the Abe Cabinet in the NHK poll has dropped these last three months, from a high of 66% in April to 57% last week. However, the cabinet's numbers are down only 7 percentage points from December, when Abe took office. How aberrant is this stability? 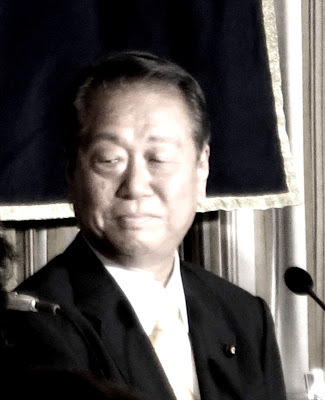 One has to go back to the tenure of Obuchi Keizo (30 July 1998 - 5 April 2000) to find a prime minister who was fewer than 7 points down seven months into his tenure. The figures for the Obuchi Cabinet were truly wild. It started out in deep fried territory at only 38% support, fell to the cabinet collapse level of 20%, then rose up to nearly its starting numbers. 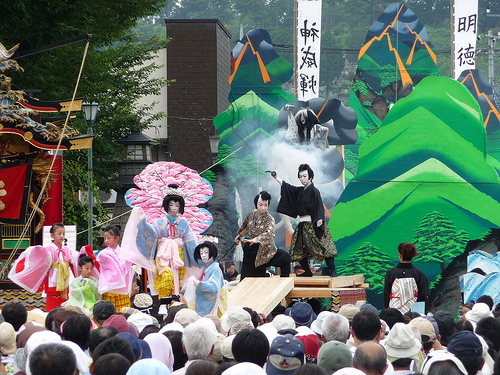 The Obuchi Cabinet finished out the year more popular than when it was announced. 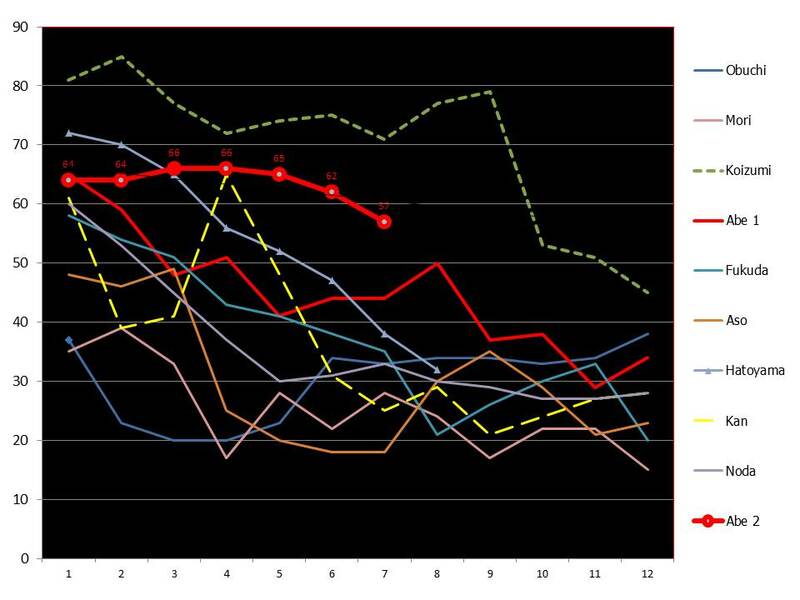 Getting back to support numbers for Abe II (look the red lines - Abe I and Abe II started out at exactly the same level) they are simply not comprehensible...unless, of course, there is dumb-as-a-sack-of-hammers direct correlation in between equities markets and Cabinet popularity. But how could that be, if the country has only a weak private equities ownership culture? Later - The theory that 30% of the voting age population was whisked off the streets in December and replaced with an army of Abe-loving replicants grown and indoctrinated in a vast biocomplex located underneath Liberal Democratic Party headquarters, while improbable, at least has the virtue of being consistent with the polling data. Why does he walk with his back to us, aside from the practical reason that it is easier to have a hair double than a face double? Is he our boss and we his underlings, trailing in his wake? Is he our leader, whom we must follow, despite our being at times in not quite the right outfits for the surroundings? With the great man's head of hair, still jet black at 58 (How does he do it? 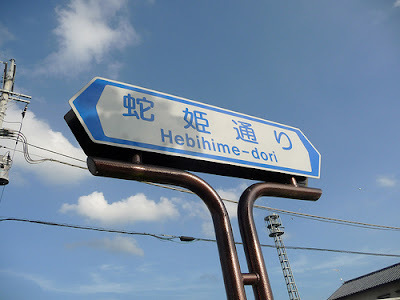 - question is facetious) we visit a modern office complex, vegetable plots, what looks like an iron ore facility, mixed farmland and suburban housing (it looks like Kanagawa Prefecture, near Oiso or Odawara), through the halls of the Prime Minister's Residential Quarters (See? He isn't afraid of ghosts! ), down a Tokyo back alley (I would say in Tokyo's Minato Ward) and in the company of two Special Police officers in a parking structure (What is he trying to say here? No fear of assassins?). We see Abe's face for the first time, from below (where else could we be, in relation to him?) as he strides through the gray awfulness that is Japanese bureaucrat offices (I would say this inside the Finance Ministry...but I have never been therein). Then we are back behind the man, going up what looks like a staircase out of the subway at Kasumigaseki, running upward with him toward the light. In the last part of the commercial we are very definitely in Minato Ward, on a rooftop in high-rise condominium-clogged Shibaura (the area on Tokyo's bayfront where a glut of these high-priced condos led to a fierce competition in between realtors which came to be known as "the Wangan Senso"). The view is toward the Rainbow Bridge and Odaiba -- though there is no obvious candidate for the building from which the shot is taken. 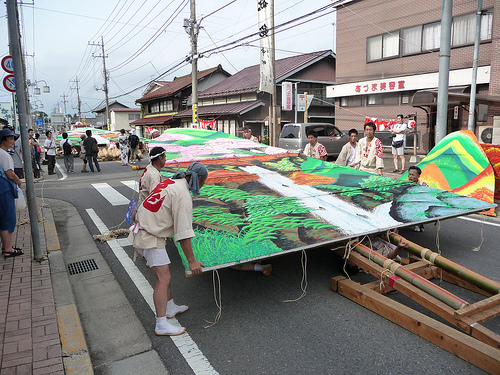 Over the scene appears the promise that "the feelings of progress and growth, with those hands" -- meaning the the hands of the viewers, not the PM -- that the people will be able to sense the results of current government policies, soon. We end the trip with a backdrop of the view in the opposite direction, toward Roppongi Hills, with the PM again facing us. Then there is the PM's voiceover through the commercial. "A new Japan is beginning to move." "Step by step, with assurance." "In health and vitality, with strength." "We will push Japan forward." 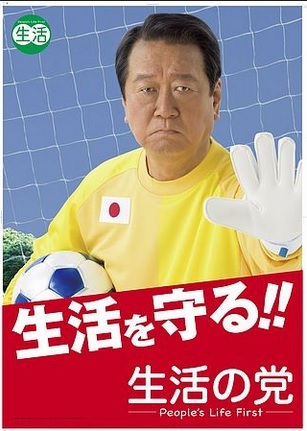 "We will take Japan back. The LDP." And are the promises of health and strength, aren't they just a little too self-referential for Abe, with his record of debilitating ulcerative collitis? Or do we need reassurance that he will not collapse this time? 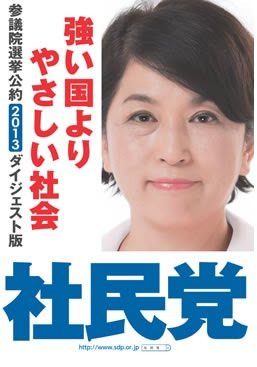 Finally, what are the voters supposed to make of this "We will take Japan back. The LDP" business? The slogan made perfect sense in December, when the government was in the hands of the opposition. But the LDP, in coalition with the New Komeito, now controls the government. If we are to take the non-snigger inducing interpretation of Abe and Company's promise to "take Japan back" (Nippon o, torimodosu), the only folks they can take Japan back from is themselves. The extensive use of the back of the PM's head and the relatively limited set of locations indicates that no one took the making of this commercial too seriously. The scenes with hidden and potential double meanings are too many to be coincidental. 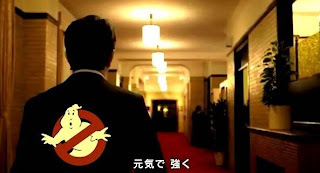 The walk down in the hallway of the Old Prime Minister's Residence, for example, takes on the ghost story -- but only, of course, for those who know what the interior of the old Residence looks like. 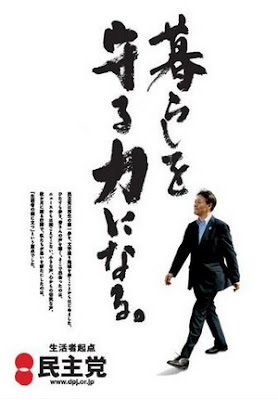 The whole "walking through Japan" theme has to be a riff on Democratic Party of Japan leader Kaieda Banri's much derided "Walking" poster released in the run up for this election (Link - J). Abe and Co. seem be feeling so comfortable (and why should they not be, given the results in the public opinion polls?) that they are taking chances, throwing the base some red meat, poking the crippled DPJ and its lame leader. At least that is the way it looks from where I am, which is behind. Later - Despite the close relationship in between the current administration and the Yomuri Shimbun, photos of Abe Shinzo and Watanabe Tsuneo together are rather hard to find. The only significant one in Google Images is this one. Of course, it is a doozy of the mutual back scratching genre, with Abe in between his two People's Honor Award honorees, both of whom were superstars for the Yomiuri Giants, with Chief Cabinet Secretary Suga Yoshihide and Watanabe sitting together right behind Matsui Hideki. Sorry...but this election is in the bag. The LDP will win almost every single-seat district. It will win at least one seat in all of the two seat districts and two in where it is running two candidates in the three-, four- and five-seat districts. 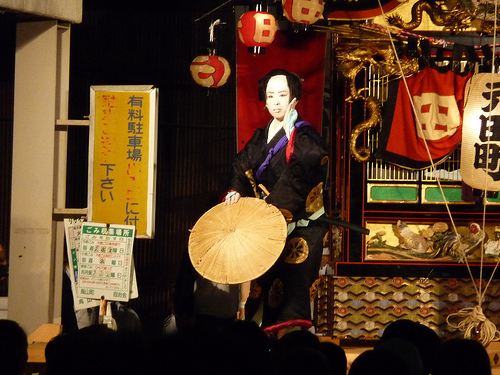 The New Komeito will pick up at least a seat everywhere it is running a candidate. The few remaining seats will the subject of bitter struggles in between the DPJ, the Japan Communist Party, the Japan Restoration Party and the Your Party. Based on a poll of 30,000 voters (now there's a sample!) the Mainichi Shimbun is predicting the LDP will win around 70 seats outright (Link - J) -- i.e. the party will be in the position to reel in a handful of independent or conservative opposition lawmakers and be able to say, "Hasta la vista, baby" to the New Komeito. 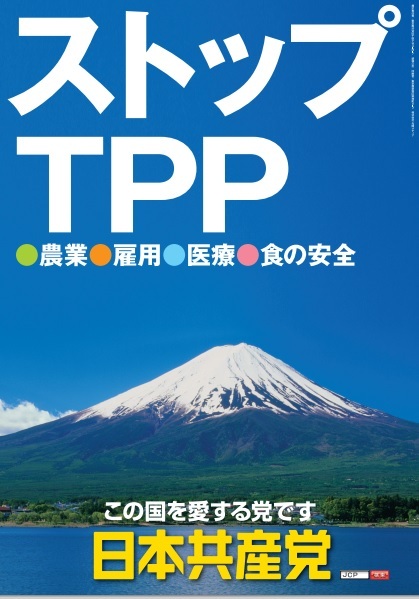 The LDP will not actually sever relations with the New Komeito because the party faces a significant breakaway this fall of lawmakers opposing Japan's participation in Trans Pacific Partnership negotiations. However, having at least the theoretical potential to dump the more reticent and passive New Komeito will significantly alter the balance of power in between the LDP and its ruling coalition partner. 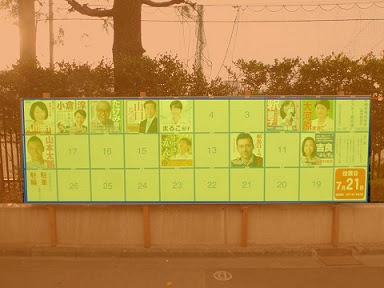 The number of seats "X would have to win in order to do Y"
Since the installation of the Abe Cabinet, most of the country's terrestrial broadcast networks have been noticeably chary of taking on the foibles of the government or the Liberal Democratic Party. If you are the national broadcaster NHK, keeping in tune with the government is a matter of life and death. 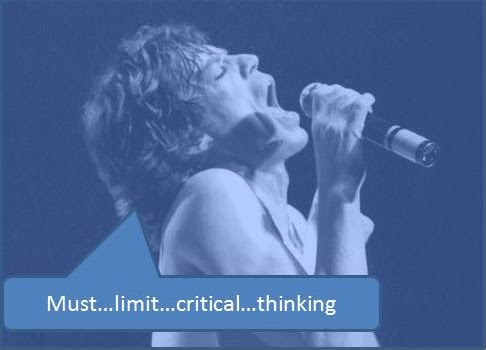 If you are a commercial network, and your management is not in cahoots with the government (and most readers know exactly exactly which network that is), then keeping your head down is still smart. The one network that has eschewed self-censorship since the change of governments is Tokyo Broadcasting System Television (TBS - Link - J). Broadcaster of the acerbic Asa Zuba! morning show (Link - J) hosted by the tireless and at times volcanic Mino Monta, TBS has not lowered the temperature of its news broadcasts since the advent of Abe II. Well, it seems that the whip has come down. Really? Threatening a break off of relations on the first official day of the election campaign season, more than a week after the supposed heinous broadcast? Are you that bloody defensive and/or thuggish? TBS has so far not apologized for its broadcast, though it is in negotiations with the LDP on a restoration of normal media relations. One could hope, and it is likely a fool's hope, given what has happened in the past to networks critical of the government (see footnote 9 here) that TBS holds its ground. In a fantastical Japan, TBS takes the LDP lockout as an opportunity to give the opposition unlimited air time (and perhaps some hints on presentation) to lash out at the ruling coalition. Later - Who owns TBS?